Hunger Task Force believes that every person has a right to adequate food obtained with dignity. MyPlate: What Do I Donate? Hunger Task Force is Milwaukee’s only Free & Local food bank and Wisconsin’s anti-hunger leader. Hunger Task Force believes that every person has a right to adequate food obtained with dignity. We work to prevent hunger and malnutrition by providing food to people in need today and by promoting social policies to achieve a hunger free community tomorrow. Our core values are justice, compassion, stewardship and dignity. Our goal and mission is to end hunger in our community and state. What’s the Difference between Hunger Task Force and national food bank chains? 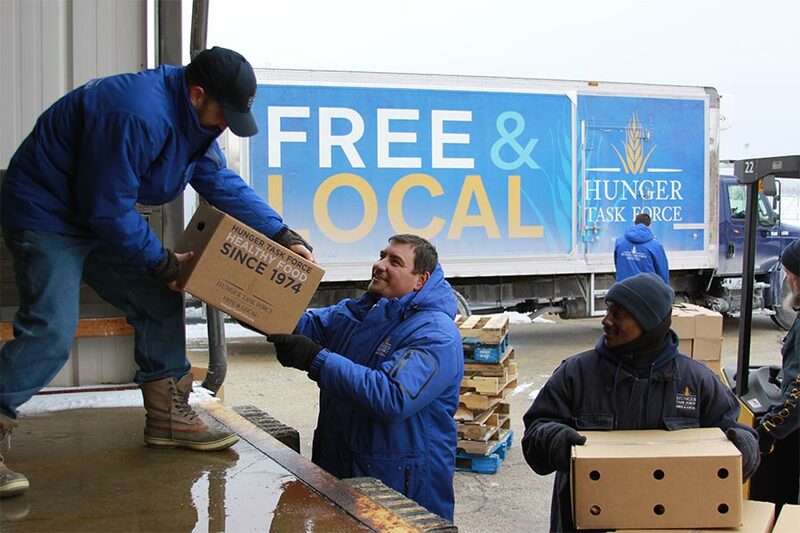 Hunger Task Force’s mission and Free & Local model are unique. Unlike national food bank chains, Hunger Task Force does not charge local pantries for food, delivery or network membership fees. We believe that healthy food should be provided free of charge based upon need, not upon an organization’s ability to pay. Our organization is supported 100% by the local community…donors support Hunger Task Force because they believe in the Free & Local model to end hunger. Hunger Task Force believes that every person has a right to adequate food obtained with dignity. Hunger Task Force works to prevent hunger and malnutrition by providing food to people in need today and by promoting social policies to achieve a hunger-free community tomorrow. Feeding America Wisconsin, Inc. solicits food donations and monetary contributions to feed the hungry. Food donations are distributed to qualified non-profit programs that directly feed hungry children, families, and individuals. Established in 1974 by a group of concerned community leaders organized to convince the public schools to begin serving school breakfast to reduce childhood hunger. Established in 1982 by the Rotary Club of Milwaukee with the concept of feeding the hungry in Wisconsin by soliciting food that would otherwise be wasted and distributing it to qualified non-profits. Distributed 10 million pounds of food in 2012-2013. Serves a network of 80 emergency food pantries, soup kitchens, and homeless shelters in the Greater Milwaukee area. 49% of revenue is donated or government commodity food. Top 3 food donors or events are Food for Families, Stamp Out Hunger, and Organic Valley. Distributed 20 million pounds of food in 2012-2013. Serves 1,100 qualified non-profits in 22 Eastern Wisconsin counties. 88% of revenue is donated food. Top 3 food donors are Feeding America (national), Walmart, and Roundy’s. 42% of revenue is cash donations. Spent $628,060 on fundraising (8% of fundraising total). Financial information from 2012-13 990. Top 3 cash donors are Harley-Davidson, Kohl’s, and Northwestern Mutual. 8% of revenue is cash donations. Spent $1,135,235 on fundraising (27% of fundraising total). Financial information from 2012-2013 990. Top 3 cash donors are Feeding America (national), Feeding America Eastern Wisconsin Foundation, and Anonymous. 813,000 summer meals served through Kohl’s Serving Up Supper for Kids. Foodshare outreach assists seniors, families, and people with disabilities obtain grocery store buying power. Addresses childhood hunger by advocating for well-run school meals programs that serve breakfast, lunch, and supper to children and youth. Mobile pantry delivers excess food on streets. Kid’s Café and Backpack Buddies programs. Hunger Task Force collects and delivers all food absolutely free of charge. Akin to Sam’s Club, shoppers pay annual membership fees to shop for food that costs 19 cents a pound. Hunger Task Force is an independent anti-hunger organization created in Milwaukee to serve Milwaukee. Feeding America Eastern Wisconsin is one franchise of over 200 food banks in the Feeding America network. Their national office is in Chicago.